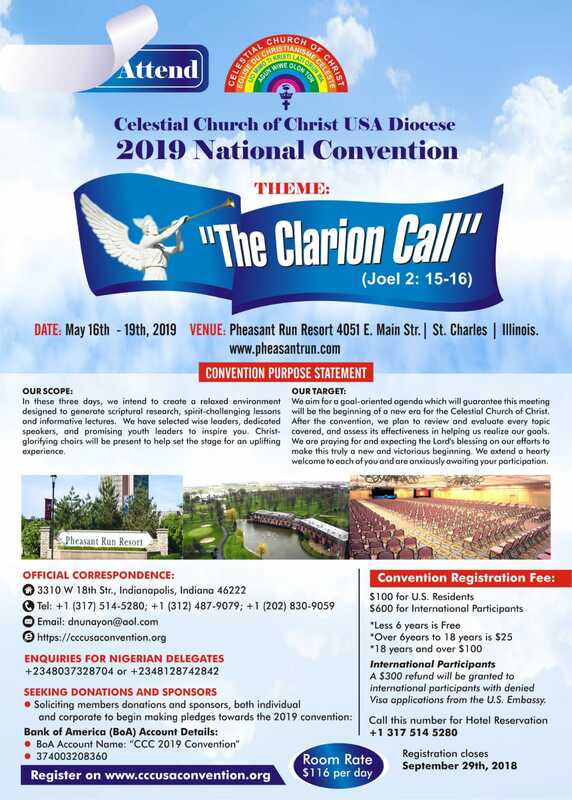 The biennial convention of Celestial Church of Christ, USA Diocese is around the corner. The Celestial Church of Christ in the United States of America is a part of one spiritual, global, united and holy Church with the mission of evangelizing the world through the proclamation of the word- the good news of the Messiah Jesus Christ, and the kingdom of God. The forthcoming convention tagged “The Clarion Call” will evaluate the current condition of the church and attempt to provide lasting solution to highlighted challenges at the convention. Recommendations from this convention will have a spiral effect on the Celestial Church of Christ, worldwide. I bet, you don’t want to miss this epoch making event. What dates are we talking about? Pheasant Run Resort, St Charles Illinois United States of America. check www.cccusaconvention.org and book your spot. Unfortunately, we can no longer accept international participants due to logistics reason and inadequate time for visa application. Where do I stay during the convention? How do I get to Convention ground? Are there business opportunities at the Convention? Kindly send all adverts/Personal greetings with photograph to dnunayon@aol.com by March 31, 2019For sponsorship and support, you can get speaking opportunity with all the attendees, and you can also show case your products/wares at the Vendors Pavilion during the 3-day event for $100 a day, Kindly email lil.mole@gmail.com or call 780-807-7200 for the sponsorship package and vendors contract/form. What makes this convention unique? Unifying and Institutionalizing Celestial Church of Christ Worldwide. Is there any fun activity on the Agenda? Yes, there will be Gala Night on Saturday May 18th, 2019. You won’t want to miss it. It promises to be fun-filled! The outfit for this gala dinner is flamboyant traditional, so come with your best attire and dancing shoes.2019 CCC USA Convention, It’s going to be Spiritual It’s going to be Refreshing It’s going to be funDon’t be left out, REGISTER & PAY FOR YOUR HOTEL NOW!